Learn how to use Scout to accept electronic payments via Credit Card and PayPal. Braintree is the merchant payment processor integrated with Scout. Click on the "Payments" Tab under the Billing heading in the left settings navigation. 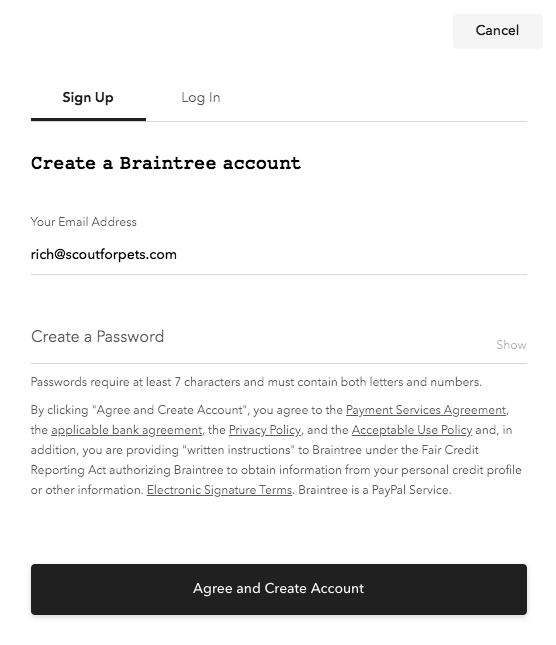 To create a new Braintree Payments account or to link an existing account, click the "Connect With Braintree" button. You will be redirected to Braintree Payments' website to continue the setup process. If you already have an account with Braintree, you can sign in using PayPal or your Braintree Payments Account Login. If you do not have a Braintree Account, click the link below the blue PayPal button. Next, fill out all the required fields to set up your business account and click the Next button to continue the set up. Complete the fields required to set up your business's representative and click the Next button to continue. Complete the fields required to set up your processing information and click the Next button to continue. Complete the fields required to set up your delivery details and click the Next button to continue. * "Day of Delivery" for "When do You charge?. * Select within 7 days for "When do you deliver?" Complete the fields required to set up your bank account information and click the Next button to continue. If you have a PayPal merchant account and wish to link it to accept PayPal, enter the email address associated with your account. Authorize Scout to bill pet owners on your behalf (automated billing). After you authorize Scout, you will be returned to the Scout site. Once you complete the Braintree setup, you will be sent an email from them. You must respond to this email to complete the setup process. Braintree will allow you to accept credit card payments right away but you must respond to the email or you will not receive your deposits or be able to accept PayPal. Responding to their email starts a review process. This process usually takes less than 24 hours but may take longer in some circumstances. Enabling Cash, Check, etc in the business settings will enable cash for all customers and disable the ability to accept automated electronic payments. Please read this documentation before enabling this feature.